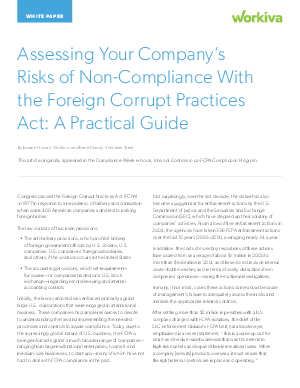 If your company is engaged in international activities, it's critical that you assess and understand the risks of non-compliance with the Foreign Corrupt Practices Act (FCPA). To avoid becoming a costly statistic, you need to design your controls accordingly. Download this white paper from experts Joseph Howell, Cofounder and Executive Vice President at Workiva, and Brent Macey, Director of Internal Audit for Schnitzer Steel Industries, Inc. They'll discuss the major components of the FCPA, and how companies can perform the risk assessment process in an efficient manner. They'll also provide a practical guide to implement internal controls for FCPA at an international level.